The main function of importance identified from the Elbe RWG was in relation to Transport and Accessibility (Figure 13). This relates to the requirements for port operation and in particular, vessel movement along the estuary to the port of Hamburg. The maintenance of this vessel passage and future port operation requires fairway deepening, but this has hydrodynamic and Habitats & Species Directive (HSD) issues for the estuary. Figure 13: Elbe uses/issues importance weighting. In deriving the conflict matrices for the Elbe, the Elbe RWG participants ranked Flood Protection & Assimilation, and Recreation & Social Use function as being of moderate importance. The Elbe has been divided into 7 management zones for the purposes of the TIDE project stretching from the reach immediately upstream of Hamburg, to the mouth of the estuary. The majority of the intertidal and subtidal area of the tidal Elbe is protected under the HSD as a Natura 2000 site, with only the reach around the main city and port of Hamburg not included within this designation and with further designation upstream. In addition, sections of adjacent terrestrial habitat are also designated, e.g. agricultural land east of Freiburg and around Krautsand. Considerable modification to the channel occurs around the city of Hamburg (arising from the Suderelbe and Norderelbe channels), with anabranch modification for vessel traffic and port related activity in this area. Downstream from Hamburg the Elbe contains a series of islands and sub-channels, but with the main fairway maintained through maintenance dredging to allow safe vessel transit. The results of the conflict matrix process (Figure 14 & Table 1) identified 12 high level conflicts (5 with a score of -10 or below), primarily relating to the impact of conservation protection of intertidal habitat on recreational access and navigation; flood protection from dykes on the conservation of the intertidal area; navigation (dredging and vessel movement on the conservation of the intertidal areas; and agricultural run-off on intertidal and subtidal habitat protection. Nine strong synergisms (with 3 scoring 10 or above) were also recorded (Figure 14 & Table 2) from the various aspects of conservation protection as well as with landscape character; various aspects of navigation requirements as well as flood protection; and flood protection and residential housing provision. 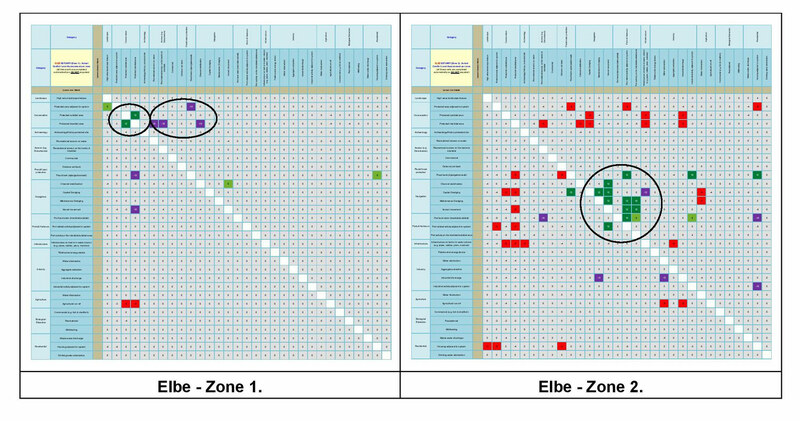 Figure 14: Elbe - high scoring user interactions per zone. Table 1: Strong negative associations between uses/users for the Elbe Estuary. Table 2: Strong positive associations between uses/users for the Elbe Estuary. 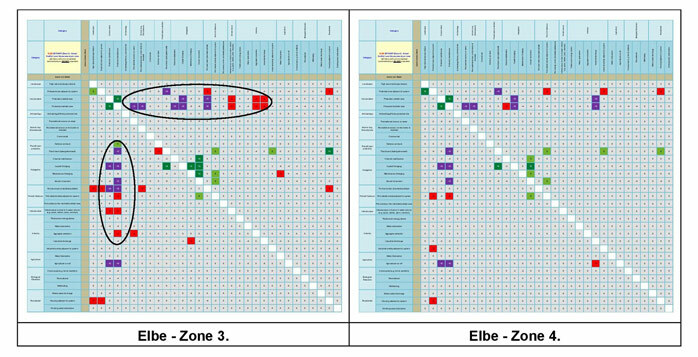 Figure 15a: Main conflict scores for the Elbe Estuary. Zone 1 (Figure 15a) of the Elbe is located upstream from the city of Hamburg. It is included within the Natura 2000 designation and features a mix of residential and agricultural land. The zone was assessed as having a relatively low level of high scoring conflicts, but with conflicts noted arising from conservation protection on recreational access, flood protection and channel stabilisation, and from flood protection and vessel movement on conservation protection in the intertidal zone. Synergisms between the conservation protection of the intertidal and subtidal habitats were also recorded. 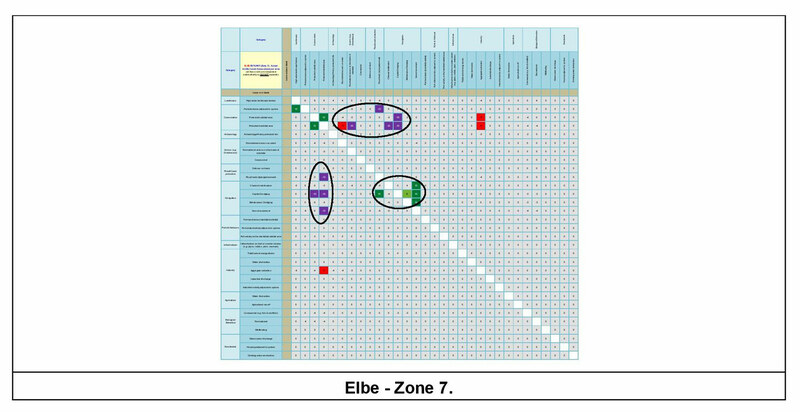 Zone 2 (Figure 15a) of the Elbe is located within much of the City of Hamburg limits as well as within the main Hamburg port area. There is considerable level of residential activity here, as well as ports activity, but with the majority of the reach excluded from any Natura 2000 designation. Analysis identified a greater number of conflicts occurring in this reach, but with a proportional reduction in severity, these tending to arise from the effects of port activity and navigation on protected conservation areas, as well as from protected conservation areas on port activity and navigation, the reduction in severity presumably reflecting a reduction in Natura extent. However, a cluster of synergistic effects were identified relating to ports and navigation measures. Zone 3 (Figure 15b) includes a part of the City of Hamburg, reduced port activity, and inclusion under Natura 2000. A slight reduction in the number of conflict areas was noted from Zone 2, but with a greater severity of conflict occurring, these primarily relating to the impacts of conservation protection on recreation, flood protection, navigation, port activities and industry, reflecting the inclusion of the intertidal and subtidal reaches within Natura 2000. Further severe conflict areas resulting from flood protection, capital dredging, vessel movement, land claim and agriculture on conservation protection of the intertidal and subtidal zones were also noted as might be expected, but again, expected synergies between vessel movement and port operation occur. Figure 15b: Main conflict scores for the Elbe Estuary. Zone 4 (Figure 15b), which is located outwith the main urban and port area of Hamburg features a mix of residential and agricultural land use as well as navigation management requirements for upstream access to the port and inclusion within the Natura 2000 designation. This zone features a further reduction in the number of high conflict combinations, but with a broadly similar pattern of high level interactions as those observed in Zone 3. Figure 15c: Main conflict scores for the Elbe Estuary. 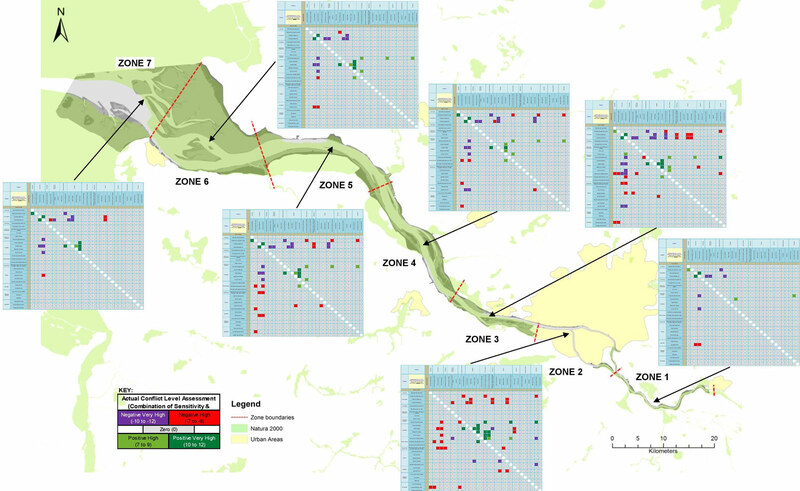 Zone 5 (Figure 15c) features a broadly similar land use composition to that of Zone 4 with conflict combinations and severity (as well as synergisms) also broadly comparable (slightly increased) to the zone. Zone 6 (Figure 15c) located at the broadening mouth of the estuary includes the port of Cruxhaven and shows a further reduction in severe conflict combinations, with conflict areas remaining from conservation protection on navigation and recreational access and navigation on protected areas. Figure 15d: Main conflict scores for the Elbe Estuary. Zone 7 (Figure 15d) which is effectively the open coast at the mouth of the Elbe again sees the number of high conflict areas reduce, but with specific issues remaining between conservation and recreational access, flood protection and navigation and flood protection and navigation on protected conservation areas. The RWG for the Elbe scored the four main use topics as marginally below the mean (5.8 compared to a mean of 6.0 for all the TIDE estuaries), indicating a broad correlation of use importance weighting. Transport & Accessibility was rated as most importance but with Ecological Function & Diversity also scored as high importance. The conflict matrices for the estuary indicate that the main management problems are associated with the provision of safe navigation requirements stretching from the estuary mouth to the port of Hamburg, with the most severely scored conflicts from this use occurring with requirements for the protection of Natura 2000 interests in the estuary. Similarly, the need to meet the requirements of the Natura 2000 Directives incurs a potentially high conflict on the need to maintain safe navigation along this part of the estuary and further upstream. As might be expected, the absence of Natura 2000 interests within much of Zone 2 which features the main City of Hamburg urban area as well as the ports industry centre means that the impacts of nature conservation concerns are reduced in this reach, whilst in general, the frequency of high scoring conflict interactions between users reduces towards the mouth of the estuary, away from the urban and ports centres, despite these reaches being included in the Natura 2000 designation. However, issues relating to navigation requirements and conservation interests remain in these areas. Section 8 (Appendices) provides the Conflict Level Assessment spreadsheets for Zones 1 to 7 of the Elbe in greater detail (larger scale).